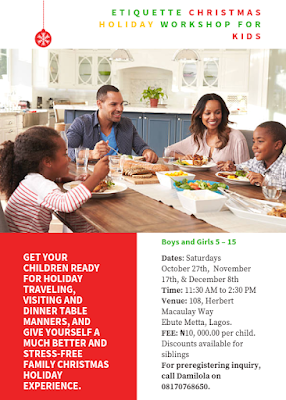 GET YOUR CHILDREN READY FOR HOLIDAY TRAVELING, VISITING AND DINNER TABLE MANNERS, AND GIVE YOURSELF A MUCH BETTER AND STRESS-FREE FAMILY CHRISTMAS HOLIDAY EXPERIENCE. Boys and Girls 5 – 15. Dates: Saturdays October 27th, November 17th, & December 8th Time: 11:30 AM to 2:30 PM Venue: 108, Herbert Macaulay Way Ebute Metta, Lagos.FEE: ₦10, 000.00 per child. Discounts available for siblings. For pre-registering inquiry, call Damilola on 08170768650.